During a recent interview with Koh Dong-jin, president of mobile at Samsung, Bloombergreports that under the company’s Note brand, Samsung hopes to launch its foldable smartphone sometime in 2018. 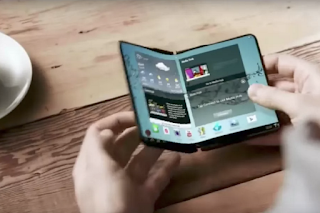 If you’ve been under a rock all this time, a foldable phone from Samsung has been hyped for years by tech media, ever since the company showcased its Youm display technology at CES in 2013. and now it seems like everybody is talking about it, even though they have launched “Edge” devices and Infinity displays since then. Anyway, the big takeaway is that Samsung wants to launch this foldable smartphone under its Note lineup, which is sort of odd, but it is mentioned that this will only happen if Samsung can solve a few “problems.” Currently there isn't any specifics are provided for what these problems are, but our assumption is that it has to do with the production/manufacturing aspect. we can’t even begin to contemplate all of the inventing Samsung will need to do in order to provide a premium smartphone experience, complete with a foldable display. All in all, this isn’t something they will want to rush. In addition to foldable phone talk, Samsung also discussed its AI-powered speaker again, the same one we’ve reported on a few times.